This post is long overdue, but I'm sure you all understand how busy the holiday season can be. Jeff had to be on call for the holiday weekend so we spent the weeks prior doing the Christmas activities that we love. We saw the Nutcracker! We go see it every year. The New York City Ballet does such a fantastic job. This year we decided to give Handel's Messiah a try but probably won't be doing that again. It was hard to stay awake. We also went to the Met and the Met Breuer for two great exhibits. The one at the Met Breuer was on Edvard Munch. I love the art of the German Expressionists and Edvard Munch was very influential to the German Expressionist movement. I love the emotions seen on the faces of his subjects. At the Met we saw an exhibit on David Hockney. This same exhibit was shown at the Tate Britain. At that showing, according to The New Yorker, nearly half a million people lined up to see it. The exhibit at the Met was certainly crowded as well. It made it hard to get some decent pictures causing me a great deal of frustration. Before the exhibit I had heard of David Hockney but had not seen much of his work up close. I wasn't sure how much I would like the exhibit, but I enjoyed it very much. I really enjoy his color palettes and use of space. When Jeff was at work Christmas day a manhole exploded next to our hotel shutting off the power. No heat, hot water, lights, internet, or television. I got a lot of reading done. When Jeff got home we ordered Chinese food but before it arrived Jeff was called back into work. I was bummed but Jeff had it far worse than I did. We needed a Christmas re-do! New Year's Eve and the day prior we got just that. We went to Mystic, Connecticut. We got lunch at Mystic Pizza and it was delicious! We went to the aquarium and then to Foxwoods Casino to see John Oliver do stand-up. It was funny but not as good as his show on HBO. 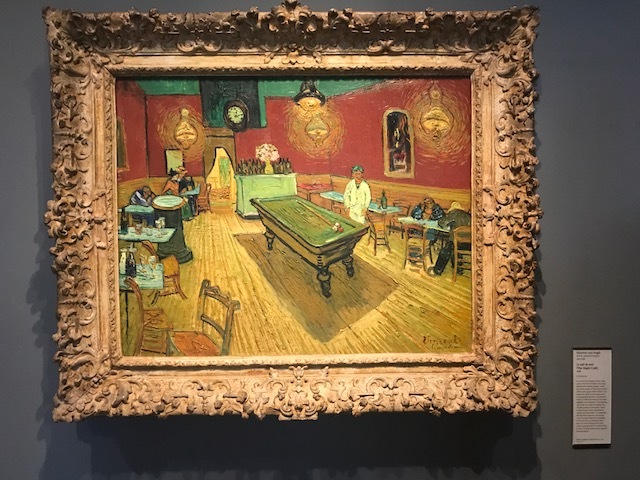 For New Year's Eve we went to Yale's University Art Gallery and saw this beautiful piece by Van Gogh. We picked up some food and then went back home to White Plains, NY. I had purchased some Kedem Sparkling Grape Juice to go with our midnight kiss! It was a hit. During the holiday season I got quite a few commissions which I had to keep secret. Now I can share them with you. I believe I told you before that the daily sketch I did of Jeff on the toilet in Israel was very well loved. Our friend Alex requested a colored version of the sketch to decorate his bathroom! Jeff's aunt Mindy also requested a couple of portraits! And our friends Diana and Daniel requested one as well. Thanks to all of you for your support. It is so very appreciated! I survived 2017! It was a very long year. Now I can look forward to the new year and hopefully many new projects. I am also looking forward to more art exhibits and travel! At the end of the month we are headed back to Montreal and Quebec City. I can't wait to sketch that trip! And in March we will be moving back to Maine! Wasn't expecting that. Look for many lobsters and lighthouses in my daily sketches there.